Taking Emanuel into the 21st Century. As a Part 1 Registered British Ship Emanuel’s ownership is fully documented. We still retain the original Blue Book Registration document with all the owners recorded on it. This is now superseded by a distinctly unimpressive laminated A4 piece of paper which has to be renewed every 5 years, instead of the in perpetuity document that the Blue Book was. So much for the UK governments interpretation of perpetuity! Failure to renew this new document - and pay the fee - risks losing the vessels name, a name she has had since that 1928 launching ceremony. 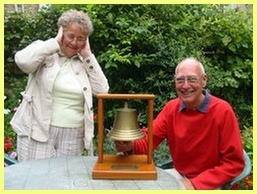 We - Robert and Jan Holden - as joint registered owners are her 15th owners. Her first owner, Cdr Robert Douglas Graham RN, chose the name Emanuel - meaning God is with us - after a ship of the same name from his home port of Bridgwater, in Somerset. This little ship sailed in Frobishers third expedition to Baffin Land in 1538. He said “it seemed a strange name at first but before long she grew into her name”. Perhaps ‘she’ should be a ‘he’ with such a masculine spelt name. Anyway it was under his ownership that Emanuel made many spectacular voyages. Besides the well document cruises to The Faeroes and to Newfoundland he, and his daughter Helen, took her to the north coast of Spain, the Channel Islands and around Great Britain. Over Christmas 1936 Emanuel was sunk by ice on her mooring at ‘Lake’ in Poole Harbour. The ice floated off the mud flats and was brought down by the outgoing tide, cutting into her as it was swept past. A supreme irony given that she had only recently returned from Newfoundland - an area of icebergs and hard weather - and survived. Emanuel was raised, repaired and sold. In 1936 Cmdr Graham began to have thoughts of a voyage around the world and commissioned Andrew Anderson to design a craft suitable for such a venture. Andrew had already remarked on hearing of Emanuel’s voyage to Newfoundland that if he had intended to go to Newfoundland he “would have build the boat to do it!” Well Andrews chance came with this proposed round the world voyage and so he came to build Emanuel’s successor, the yawl Caplin’. Emanuel passed into the ownership of a Mr Deveroux in 1937 who in turn sold her in March 1944 to Francis Scott, a Flight Lieutenant in the RAF. Ownership changed again in March 1945 to Cecily Stark. Further changes of ownership took place in April 1945, March 1948, August 1948, Feb 1951, August 1967, April 1969, May 1971, August 1976, March 1977, September 1978 then ourselves in February 1980. 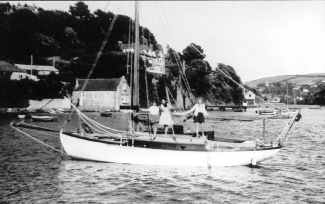 It was under the 1951 to August 1967 ownership of Arthur Connell, when Emanuel was moored in the River Exe, that she parted her mooring in a south easterly gale - being driven up river to ground on a sand bank. We are told by the person in question - who was only around 10 or 12 at the time - that when the tide had gone out he set the anchor to stop her driving further up river on the next tide. The owner was so impressed and thankful enough that he presented him with a bottle of whisky - for which his father was extremely grateful! Ownership in the previous few years to ourselves was of a person living in Berwickshire and then a new owner from Co Durham. We have to thank Clifford Sutton, the next owner from March 1977, who rescued her in preventing further deterioration and stopping the water coming in with each tide. He later - in 1978 - shared ownership with Michael Paul Goodall. It was under this new ownership arrangement that Emanuel found her way to Folly on the Medina River, just above Cowes on the Isle of Wight, where she lay on the pile moorings. Emanuel remained there until we purchased her in Feb 1980, having viewed her over the chilly Christmas of 1979. She was sailed to Ramsgate over the spring bank holiday of 1980 and then some weeks later into the Kentish River Stour, just a mile or so away, ready to be hauled out at the Sandwich Sailing and Motor Boat Club for the restoration. A restoration that ultimately took a full eight years! Clifford Sutton, on the right, with his son Charles. 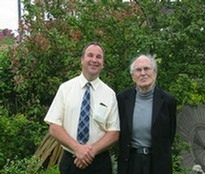 Pictured in 2008 at Clifford’s home near Bristol. 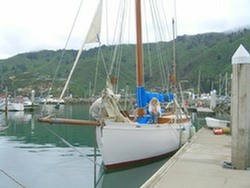 Caplin - Emanuel’s successor for going round the world - seen here in excellent condition near Christchurch, New Zealand. She has been in New Zealand since early 1940. August 1948 to February 1951.